It’s hard to believe it’s the end of April but it is so time fo rmore fun it’s the last flash giveaway for the month of April! 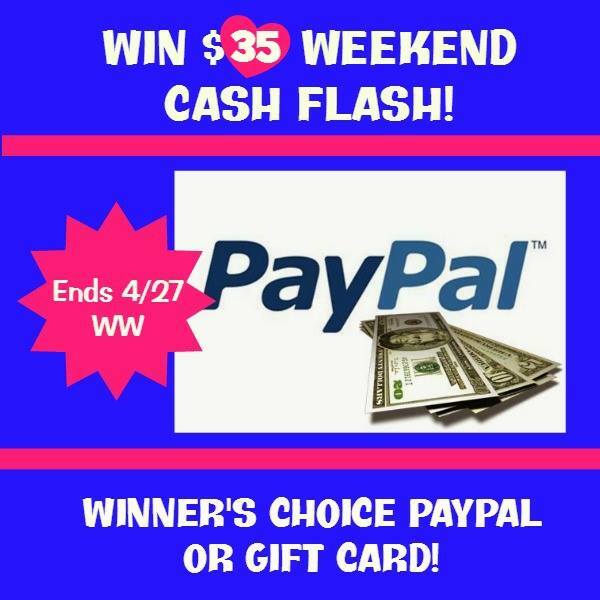 It’s winners choice too of either Paypal, Amazon or another e-card of choice. Just make sure to stop by and comment on all our bloggy friends’ pages as we’re all cihpping in for this fun prize! What would you choose? I love Amazon so that would be my choice. Go and enter and BEST OF LUCK! I love Vegas in the Spring. The Bellagio has a gorgeous spring flower display. The weather is warm and sunny, but not hot. New babies are born at the Secret Garden. Vegas is one of my favorite spots anytime of the year, but Vegas in the spring is just perfect. I love Orlando, Florida and Los Angles, California in the springtime. Universal Studios Hollywood is my new favorite spring vacation. It’s a fun place to visit, but even better when you’re not baking in the sun while waiting in the lines. Orlando is my favorite spring vacation spot. Going to the Smoky Mountains =) The wildlife, streams, and forests are breathtaking! I havent traved foe a year in half that was to spend a month in england had the best time ever so much to see especilly my new grnddaughter . I love Cape San Blas Beach in Florida! We don’t travel. We mostly stay close to home and visit different parks. Ours is the Oregon coast, especially around Coos Bay/North Bend and Bandon areas. We love camping in the spring! Days are usually warm and nights are perfect to sit around a campfire. We never travel anywhere far, but we do go camping here in Alberta near Rocky Mountain House. Garden City Beach, SC (not far from Myrtle Beach. My favorite spring vacation spot is anywhere along the NC or SC coast. We haven’t had a vacation for several years but I always love the beach. Destin, Florida is a favorite place that we’ve been to before. Nashville, because my great-grandson lives there. If he lived in the outback of Australia, my choice would be the outback of Australia, and so on and so on. We love visiting the national parks, especially yosemite. I always take a Spring STAYcation to get some projects done around the house…. Favorite! Monterey Bay, CA is my favorite spot to go in the Spring. I grew up in Southern California and there isn’t anything to compare to the spring flowers in the Mojave Desert. We like to go to Myrtle Beach in SC. Spring vacation, we don’t go anywhere in the spring. We get cleanup from the winter done. In and outside the house. Yellowstone National Park is my favorite vacation spot. I like going to new york there’s lots to do, and the other states are so close to each other. We love to camp and we also love amusement parks so we try and integrate the 2. It works for us. Great giveaway, fingers crossed! Thanks! my fav spring spot is the patio of our local microbrewery! My favorite spot is Cape Cod ! I like Fripp Island in SC. My favorite spot is at the beach. I like a place called Cameron Highlands because the weather where I am is ALWAYS hot and the weather there is just perfect. I like La Jolla Shores & Coronado beaches in San Diego CA. Myrtle Beach is my favorite vacation spot! I can’t say it is the “most” spring-like, but I love hitting Chicago in the spring. Things are starting to bloom and tons of fun things to do. My favorite spring vacation spot is Myrtle Beach SC. I like to go to Niagara Falls. I love going to Tennessee in the Spring. We have a timeshare, but usually in Spring we just want to relax and spend time in the mountains. We enjoy walking up the creeks. My favorite spring spot in San Antonio. Love the Riverwalk! My favorite spring vacation spot is San Diego. It is near by where I live and has great weather. My favorite spot in the Spring is my garden. Highland Beach, FL is my favorite place to vacation especially in the Spring. The weather is wonderful this time of year and the beach is amazing. I am in the San Francisco area and I love going to Reno, NV. Don’t take vacations in the spring. I live in San Diego so the beach is my favorite spot. I’ve never gone on a spring vacation. I love going to Pinchot Lake for a spring vacation. I love spoending time at the cabin near the river.Being out in the wilderness there is just ths feeling of renewal and life. Camping at Hocking Hills in Ohio. So beautiful!!! Anyplace with water. Ocean, lake, river in a pinch a nice pool would do! I love Arkansas in the spring. That’s where I’m from. Aside from the horrible storms the weather is awesome. Just being at home with my family. My favorite spot is at my parent’s spot by the lake. MY favorite is at a lake. By the beach on a lake. I love to visit Charleston, SC!! We live in southern CA so the beach is wonderful in the spring. We like to go there. CAMPING! Anywhere! As long as we can ride our ATVs, we’re happy. I prefer the more mild weather of the Hungry Valley OHV Park.